On May 26th 2011, a new EU directive was adopted that requires web sites to gain consent from visitors before they can store cookies or other information used to track a user’s actions. While the EU Cookie legislation went into effect last year, the UK’s Information Commissioner’s Office (ICO) set May 26th of 2012 as the enforcement date. The ICO is the body responsible for enforcing the UK regulation, with authority to levy fines on web site owners up to £500,000. In order to comply with the EU regulations and avoid the UK ICO fines, organizations need to understand what cookies their web sites are issuing and the conditions in which they are issued. Most web application scanning solutions will report the cookies that a web site is issuing. This includes cookies that may be issued by 3rd party sites that have embedded content commonly used to track users for marketing purposes. QualysGuard WAS has provided this information for some time via the Information Gathered (IG) QID 150028 (Cookies Collected). However, the way that the cookies are collected for QID 150028 as well as the way other web application scanners gather cookies may lead to the inclusion of cookies that were issued after the scanner automatically triggered the explicit user consent action. This is because web application scanners typically follow all links, including those that are most commonly used to obtain user consent. What organizations that wish to to gain a user’s explicit consent really need is a way to identify only the cookies that are issued without automatically issuing any user consent actions. In order to address this use case, QualysGuard WAS has implemented a new test (QID 150099), which avoids the most common user consent techniques while gathering cookies from the web site. In doing so, QualysGuard WAS provides organizations with information about the cookies they are issuing without the user’s consent. The best thing about the new test is that WAS includes it as a standard check during all scans run on or after 26 May, 2012. So organizations using WAS do not need to alter their scan configuration to take advantage of the new test. 1. Log into QualysGuard WAS v2 and navigate to the “Scans” tab. 6. You should see a number of results that are level 1 Information Gathered (IG) items – click on the one with QID 150099. This will show you the cookies that were identified as being issued without any user consent. If you identify any cookies that are subject to the regulation that require user consent – the next step is to set up specific user consent prompts within the web site such that the user can make an informed decision whether to accept or reject the cookies that are being set. The implementation of this will usually take the form of a pop up dialog or prompt, but the actual implementation details will vary based on the organization. See more information on the new EU Cookie Law and the UK ISO enforcement. Imagine a line at a fast food restaurant that serves two types of burgers, and a customer at the cashier is stuck for a while deciding what he wants to order, making the rest of the line anxious, slowing down the business. Now imagine a line at the same restaurant, but with a sign saying “think ahead of your order,” which is supposed to speed things up. But now the customer orders hundreds of burgers, pays, and the line is stuck again, because he can take only 5 burgers at time to his car, making signs ineffective. While developing the slowhttptest tool, I thought about this burger scenario, and became curious about how HTTP servers react to slow consumption of their responses. There are so many conversations about slowing down requests, but none of them cover slow responses. After spending a couple of evenings implementing proof-of-concept code, I pointed it to my so-many-times-tortured Apache server and, surprisingly, got a denial of service as easily as I got it with slowloris and slow POST. 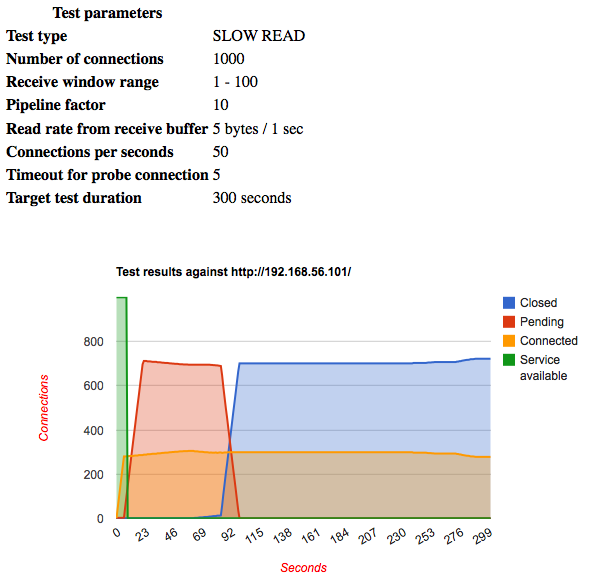 Let me remind you what slowloris and slow POST are aiming to do: A Web server keeps its active connections in a relatively small concurrent connection pool, and the above-mentioned attacks try to tie up all the connections in that pool with slow requests, thus causing the server to reject legitimate requests, as in first reastaurnt scenario. 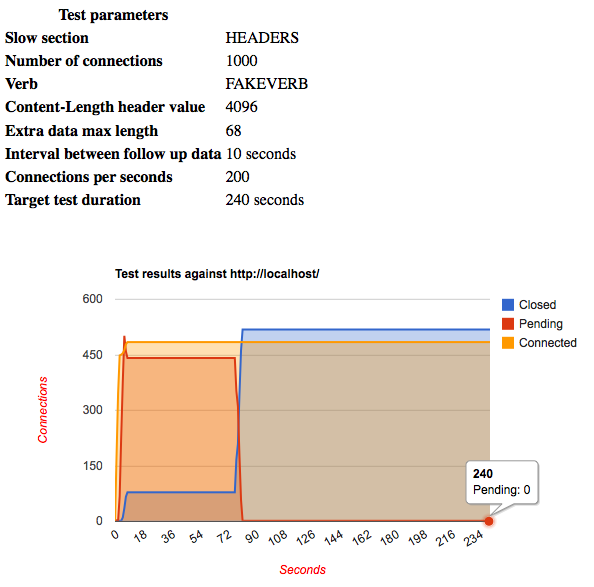 The idea of the attack I implemented is pretty simple: Bypass policies that filter slow-deciding customers, send a legitimate HTTP request and read the response slowly, aiming to keep as many connections as possible active. Sounds too easy to be true, right? Let’s start with a simple case, and send a legitimate HTTP request for a resource without reading the server’s response from the kernel receive buffer. For those who don’t feel like reading tcpdump’s output: We established a connection; sent the request; received the response through several TCP packets sized 1448 bytes because of Maximum Segment Size that the underlying communication channel supports; and finally, 5 seconds later, we received the TCP packet with the FIN flag. Everything seems normal and expected. The server handed the data to its kernel level send buffer, and the TCP/IP stack took care of the rest. At the client, even while the application had not read yet from its kernel level receive buffer, all the transactions were completed on the network layer. What if we try to make the client’s receive buffer very small? In the initial SYN packet, the client advertised its receive window size as 28 bytes. 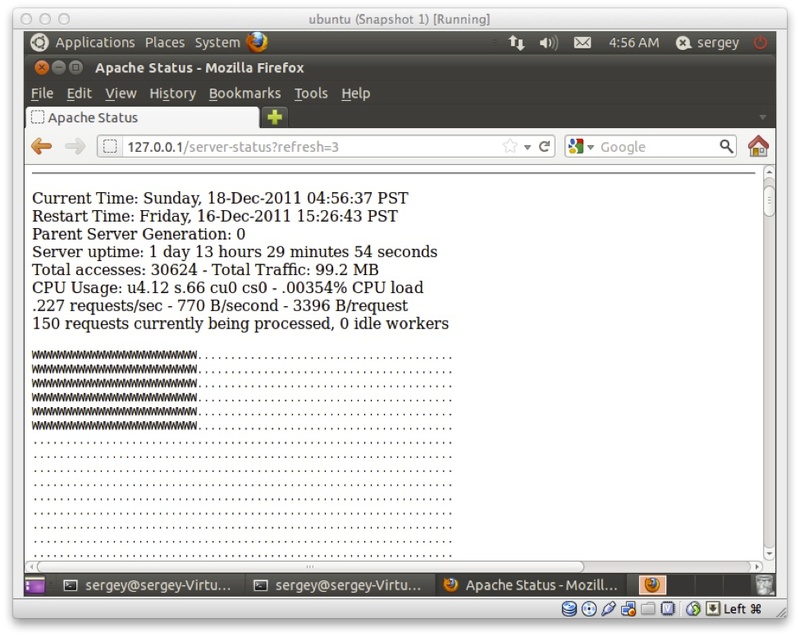 The server sends the first 28 bytes to the client and that’s it! The server keeps polling the client for space available at progressive intervals until it reaches a 2-minute interval, and then keeps polling at that interval, but keeps receiving win 0. This is already promising: if we can prolong the connection lifetime for several minutes, it’s not that bad. And we can have more fun with thousands of connections! But fun did not happen. Let’s see why: Once the server received the request and generated the response, it sends the data to the socket, which is supposed to deliver it to the end user. If the data can fit into the server socket’s send buffer, the server hands the entire data to the kernel and forgets about it. That’s what happened with our last test. What if we make the server keep polling the socket for write readiness? We get exactly what we wanted: Denial of Service. We need to know the server’s send buffer size and then define a smaller-sized client receive buffer. TCP doesn’t advertise the server’s send buffer size, but we can assume that it is the default value, which is usually between 65Kb and 128Kb. There’s normally no need to have a send buffer larger than that. We need to make the server generate a response that is larger than the send buffer. With reports indicating the Average Web Page Approaches 1MB, that should be fairly easy. Load the main page of the victim’s Web site in your favorite WebKit-based browser like Chrome or Safari and pick the largest resource in Web Inspector. If there are no sufficiently large resources on the server, but it supports HTTP pipelining, which many Web servers do, then we can multiply the size of the response to fill up the server’s send buffer as much as we need by re-requesting same resource several times using the same connection. As you can see, all connections are in the WRITE state with 0 idle workers. Even though the TCP/IP stack shouldn’t make decisions on resetting alive and responsive connections, and it is the “userland” application’s responsibility to do so, I assume that some TCP/IP implementations or firewalls might have timers to track connections that cannot send data for some time. To avoid triggering such decisions, slowhttptest can read data from the local receive buffer very slowly to make the TCP/IP stack reply with ACKs with window size other than 0, thus ensuring some physical data flow from server to client. While I was implementing the attack, I contacted Ivan Ristic to get his opinion and suggestions. I was suspecting there would be attacks exploiting zero/small window, but I thought I am the first one to apply it to tie up an HTTP server. I was surprised when Ivan replied with links to sockstress by Outpost24 and Nkiller2 exploiting Persist Timer infiniteness that are already covering most aspects I wanted to describe. However, the above mentioned techniques are crafting TCP packets and use raw sockets, whereas slowhttptest uses only the TCP sockets API to achieve almost the same functionality. We still think it’s worthwhile to have a configurable tool to help people focus and design defense mechanisms, since this vulnerability still exists on many systems three years after it was first discovered, and I consider Slow Read DoS attacks are even lower profile and harder to detect than slowloris and slow POST attacks. There is a vulnerability note on the US-CERT Web site as well as MS09-048, CVE-2008-4609, CVE-2009-1925, CVE-2009-1926 describing this problem. For protocols like SPDY and WebSocket, this vulnerability could be even more critical, as they rely on persistent connections by design. If all three conditions are met, we can assume server is vulnerable to Slow Read DoS attack. QualysGuard Web Application Scanner (WAS) uses similar approach to discover the vulnerability. For active detection, I would recommend using slowhttptest version 1.3 and up. See installation and usage examples. All servers I observed (Apache, nginx, lighttpd, IIS 7.5) are vulnerable in their default configuration. The fundamental problem here is how servers are handling write readiness for active sockets. Some servers have built-in protection, which is turned off by default. For example, lighttpd has the server.max-write-idle option to specify maximum number of seconds until a waiting write call times out and closes the connection. Apache is vulnerable in its default configuration, but MPM Event, for example, handles slow requests and responses significantly better than other modules, but falls back to worker MPM behavior for SSL connections. ModSecurity supports attributes to control how long a socket can remain in read or write state. There is a handy script called “Flying frog” available, written by Christian Folini, an expert in Application Layer DoS attacks detection. Flying frog is a monitoring agent that hovers over the incoming traffic and the application log. It picks individual attackers, like a frog eats a mosquito. Using the <Limit> and <LimitExcept> directives to drop requests with methods not supported by the URL alone won’t help, because Apache waits for the entire request to complete before applying these directives. Therefore, use these parameters in conjunction with the LimitRequestFields, LimitRequestFieldSize, LimitRequestBody, LimitRequestLine, LimitXMLRequestBody directives as appropriate. For example, it is unlikely that your web app requires an 8190 byte header, or an unlimited body size, or 100 headers per request, as most default configurations have. Set reasonably small client_max_body_size, client_body_buffer_size, client_header_buffer_size, large_client_header_buffers, and increase where necessary. Restrict request verbs using the $HTTP["request-method"] field in the configuration file for the core module (available since version 1.4.19). Limit request attributes is through the <RequestLimits> element, specifically the maxAllowedContentLength, maxQueryString, and maxUrl attributes. 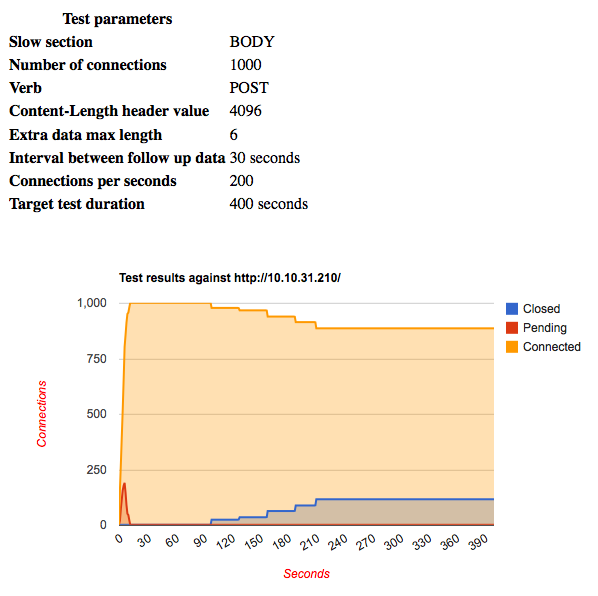 Inspired by Robert “Rsnake” Hansen’s Slowloris and Tom Brennan’s OWASP slow post tools, I started developing another open-source tool, called slowhttptest, available with full documentation at https://github.com/shekyan/slowhttptest. 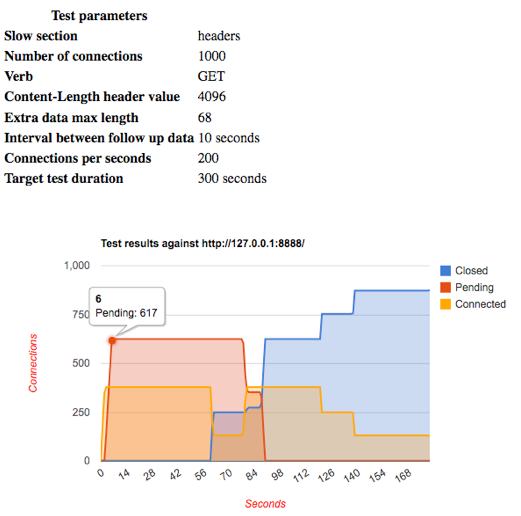 Slowhttptest opens and maintains customizable slow connections to a target server, giving you a picture of the server’s limitations and weaknesses. It includes features of both of the above tools, plus some additional configurable parameters and nicely formatted output. Any comments are highly appreciated, and I will review all feature requests posted on the project page at https://github.com/shekyan/slowhttptest. Many thanks to those who are contributing to this project. 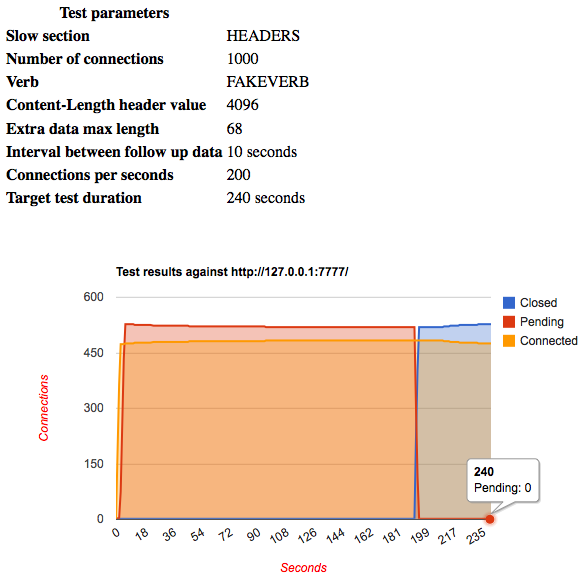 Version 1.1. of slowhttptest includes a new test for the Apache range header handling vulnerability, also known as the “Apache Killer” attack. 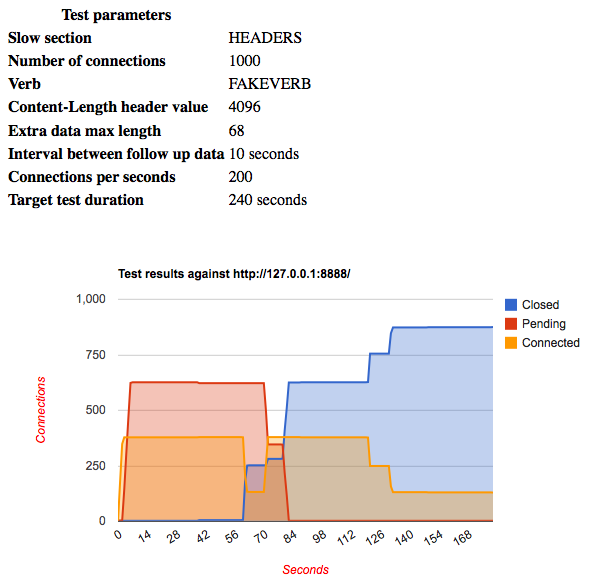 The usage example can be found at https://github.com/shekyan/slowhttptest/wiki/ApacheRangeTest. Interest in the QualysGuard Web Application Scanning (WAS) module has been growing since its new UI was demonstrated last week at BlackHat. Along with such interest come questions about how the scanner works. The ultimate goal for WAS is to provide accurate, scalable testing for the most common, highest profile vulnerabilities (think of SQL injection and XSS) so that manual testing can skip the tedious and time-consuming aspects of an app review and focus on complex vulns that require brains rather than RAM. One complex vuln in particular is CSRF. Automated, universal CSRF detection is a tough challenge, which is why we try to solve the problem in pieces rather than all at once. It’s the type of challenge that keeps web scanning interesting. Here’s a brief look at the approach we’ve taken to start bringing CSRF detection into the realm of automation. First, the test assumes an authenticated scan. If the scan is not given credentials, then the tests won’t be performed. Also, tests are targeted to specific manifestations of CSRFrather than the broad set of attacks possible from our friendly sleeping giant. Only available to an authenticated user. Are not "trivial" such as search forms or logout buttons. 2. Set up two separate sessions for the user (i.e. login twice). Keep their cookie jars apart. We’ll refer to the sessions as Aardvark and Bobcat (or A & B or Alpha & Bravo, etc.). Remember, this is for a single user. 3. Obtain a form for session Aardvark. 4. Obtain a form for session Bobcat. The assumption is that any CSRF tokens in Aardvark’s form are tied to the session cookie(s) used by Aardvark and Bobcat’s belong to Bobcat. Things should blow up if the tokens and session don’t match. 6. Examine the "swapped" responses. If the response has a clear indication of error, then the app is more likely to be protected from CSRF. The obvious error is something like, "Invalid CSRF token". Sadly, the world is not unicorns and rainbows for automated scanning and errors may not be so obvious or point so directly to CSRF. If the response is similar to the one received from the original request, then it appears that the form is not coupled to a user’s session. This is an indicator that the form is more probably vulnerable to CSRF. Look for hidden form fields with names or values that match CSRF tokens. If an obvious token is present, that doesn’t mean the app is actually validating it. Attempt to evaluate the predictability of anything that looks like a CSRF token. Nor will it demonstrate the compounding factor of CSRF onother vulnerabilities like XSS. That’s something that manual pen-testing should do. In other words, WAS is focused on identifying vulns (it should find an XSS vuln, but it won’t tie the vuln to a CSRF attack to demonstrate a threat). Manual pen-testing more often focuses on how deep an app can be compromised — and the real risks associated with it. Situations where sessions cookie(s) are static or relatively static for a user. This impairs the "swap" test. CSRF that can affect unauthenticated users in a meaningful way. This is vague, but as you read more about CSRF you’ll find that some people consider any forgeable action should be considered a vuln. This speaks more to the issue of evaluating risk. You should be relying on people to analyze risk, not tools. CSRF that affects the user’s privacy. This requires knowledge of the app’s policy and the impact of the attack. Forms whose effect on a user’s security context manifests in a different response, or in a manner that isn’t immediately evident. CSRF tokens in the header, which might lead to false positives. CSRF vulns that manifest via links rather thanforms. Apps put all kinds of functionality in hrefs rather than explicit form tags. Other situations where we play games of anecdotes and what-ifs. Reduce noise. Don’t report vulns for the sake of reporting a vuln if no clear security context or actionable data can be provided. Provide a discussion point so we can explain thebenefits of automated web scanning and point out where manual follow-up will always be necessary. Learn how real-world web sites implement CSRF in order to find common behaviors that might be detectable via automation. You’d be surprised (maybe) at how often apps have security countermeasures that look nothing like OWASP recommendations and, consequently, fare rather poorly. Experiment with pushing the bounds of what automation can do, while avoiding hyperbolic claims that automation solves everything. The current state of CSRF testing in WAS should be relied on as a positive indicator (vuln found, vuln exists) more so than a negative indicator (no vuln found, no vulns exist). That’s supposed to mean that a CSRF vuln reported by WAS should not be a false positive and should be something that the app’s devs need to fix. It also means that if WAS doesn’t find a vuln then the app may still have CSRF vulns. For this particular test a clean report doesn’t mean a clean app; there’re simply too many ways of looking at the CSRF problem to tackle it all at once. We’re trying to break the problem down into manageable parts in order to understand what approaches work. We want to hear your thoughts and feedback on this. The scary part is that these attacks can just look like requests that are taking a long time, so it’s hard to detect and prevent them by using traditional anti-DoS tools. Recent rumors indicate these attacks are happening right now: CIA.gov attacked using slowloris. 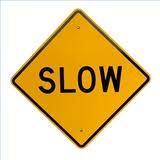 To detect a slow POST (a.k.a. Are-You-Dead-Yet) attack vulnerability (QID 150085), WAS opens two other connections, and uses an action URL of a form it discovered during the crawl phase that doesn’t require authentication. WAS assumes that if it is possible to either keep the connection open with an unfinished request for longer than 120 seconds or, even better, prolong the unfinished connection by sending a byte per T – 1 (or any random value less than T), then it’s possible to acquire all server sockets or threads within that interval. WAS also performs a supplemental test to determine unhealthy behavior in handling POST requests, by sending a simple POST request to the base URI with a relatively large message body (65543 Kbytes). 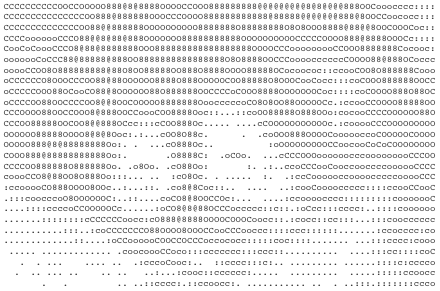 The content of the body is a random set of ASCII characters, and the content type is set to application/x-www-form-urlencoded. WAS assumes that if the server blindly accepts that request, e.g. responds with 200, then it gives an attacker more opportunity to prolong the slow connection by sending one byte per T – 1. Multiplying 65543 by the T – 1 would give you the length of time an attacker could keep that connection open. QID 150086 is reported on detection of that behavior. Mitigation of slow HTTP attacks is platform specific, so it’d be nice for the community to share mitigation techniques in the comments below. I’ll post an update with information on some of those platforms, as well as general recommendations that can be extrapolated to particular platforms.